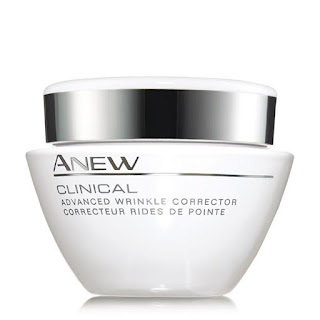 Anew Clinical Advanced Wrinkle Corrector with 4D WRINKLE-REVERSE TECHNOLOGY plumps out the look of lines and wrinkles and visibly improves elasticity and resilience. * Improve the look of fine lines and deep wrinkles by 28% overtime**. Immediately visibly plumps out wrinkles and fine lines. * 1.7 fl. oz. Benefits to YOUR beauty: Add Avon's Anew Clinical Advanced Wrinkle Corrector to your skin care regime to improve the look of those pesky lines and wrinkles. Improve your confidence knowing your skin is smooth and youthful. Avon use recommendations: TO USE: Gently smooth over face and neck, upward and outward, targeting wrinkles. Use AM and PM after cleansing. *Based on a consumer-perception study. **Based on a clinical visual grading test after 12 weeks of use.